Soundtracker feature improves transmission and reception. 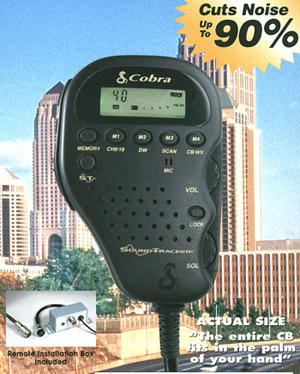 Radio features 40 citizen band channels and 10 weather channels (7NOAA and 3 International). Remote mount system installation box installs out of sight under dash and the quick disconnect allows removal of the handpiece for security or use in other vehicles. Dual watch and full channel scan, monitor two channels at one time and channel scan allows you to scan all forty channels. Instant channel 9 / 19, instant access to the emergency cahannel 9 or information channel 19 with a single push of the button. Full-featured LCD display panel, chose normal CB channel readout or five digit frequency display. Additional features, has four memory channels and key lock. Additional remote connection box available.